For Long Island shopping center magnate Wilbur Breslin, the Westbury property known as The Mall at the Source is the one that got away … at least so far. Returned to its lenders at a foreclosure auction last month, the failing retail center had been in special servicing limbo for a few years, as no one stepped up to buy the mall’s $124 million note that’s been in default since 2009. Not that there’s any shortage of prospective buyers, Breslin among them. There are just none willing to pay anywhere near that price. The value of the Source Mall has plunged to about $51 million, according to a May appraisal, a fraction of its $124 million loan and down from the $90 million appraisal it received in 2011, according to Trepp, a reporting agency for securitized loans. The mall was appraised at $178 million in 1998 when the loan was originated. And then there’s the cost of demolition, financing challenges and zoning restrictions, all making any deal for the Source unlikely, anytime soon. Another retail developer who considered the Source, Ed Blumenfeld of Syosset-based Blumenfeld Development Group, said the mall was poorly laid out to begin with, which hastened its demise. Breslin agrees and said a major problem is the awkward layout of the first floor, which doesn’t provide an expansive view for incoming shoppers. “They expect to see vistas of many stores. The Source doesn’t have that,” he added. Blumenfeld, whose company developed the Tanger Outlets at the Arches in Deer Park, among other large shopping centers, said the Source could remain a retail use or it could become a walkable residential community with the right design. Jan Burman, a principal of Engel Burman Group in Garden City, said the Fortunoff building could be redeveloped into “some type of residential” and the mall portion could become a back-to-back open-air strip shopping center for the mall portion. He envisions an atrium that could connect the two properties. Another proponent of a residential future for the Source is Brandon Palanker, of Plainview-based Renaissance Downtowns. “Even though it’s not a traditional walkable downtown environment, the acute lack of rental options on Long Island may provide a market opportunity for that type of product,” he said. Palanker added that a rental component could be a carrot for lenders in securing the financing needed for the Source’s eventual redevelopment, since banks these days will more readily loan for multifamily projects than retail or other uses. Polimeni doesn’t think more retail is a viable option for the property because current supply far exceeds the area’s demand. Over the years, Breslin had a couple of brief flirtations with the Old Country Road property, once getting as far as a canceled contract signing in the 1980s. The parcel, then owned by Gulf & Western, instead went to adjacent department store owner Alan Fortunoff for $65 million, the same bid as Breslin’s. Small-world story: The two were next-door neighbors in Old Westbury. “He had been negotiating with them for two years, but I wasn’t aware of it at all,” Breslin recalled. After making a deal with Fortunoff to build it and connect it to his family’s flagship department store, Indianapolis-based Simon Property Group opened the Source in 1997, attracting more than 70 tenants, including Virgin Megastore and the Rainforest Café. But when Fortunoff closed in 2009, two of the mall’s largest tenants – Circuit City and Steve and Barry’s – folded their tents as well, followed by smaller stores like Starbucks, Ann Taylor, Gap, Men’s Wearhouse and many more. Tenants that occupied about 120,000 square feet of space at the Source have taken their acts down the road to the newly opened Gallery at Westbury Plaza, among them former Source anchors Nordstrom Rack, Saks Off Fifth and Old Navy. Simon had already sold its controlling interest in the Source, but continues to manage the property. 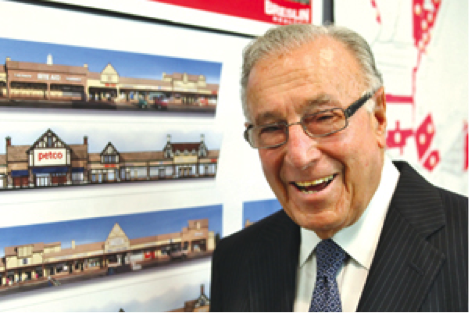 Shopping center czar Breslin is continuing his pursuit of the Source property, even though he’s been frustrated by the lack of a majority voice or central decision maker for the current owner, a multinational fund with about 250 shareholders worldwide.